The kelvin.36 is designed for all of your daily fixes around the home. With 36 tools in one, it's the ultimate indoor DIY Multi-tool. Dimensions: 5" x 2" x 1.5"
The idea for this Grommet came to entrepreneur Kevin Royes as he sorted through his toolbox, trying to find all the instruments needed to hang a picture in his apartment. Could he get rid of all this “stuff” and combine all the single-purpose tools—the hammer, tape measure, level, screwdriver—into one piece of equipment perfectly sized for the urban home? Yes, he could. Kevin’s creation is the kelvin.23. Just about everyone, from a college kid to an elderly parent, could benefit from one of these snazzy little devices in their home, car, or boat. 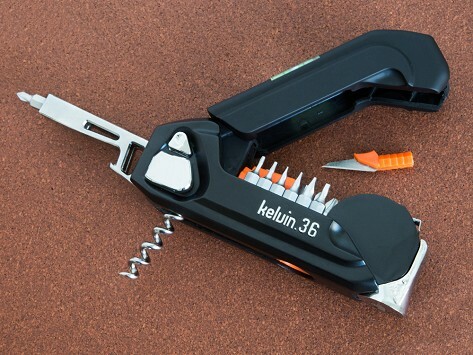 The kelvin.23 includes 23 essential tools in one sleek, compact package. It’s perfect for routine household tasks like hanging a picture, unscrewing a battery cover, or putting together your latest ready-to-assemble furniture purchase. The kelvin.23 is designed around a 16-bit screwdriver, which is tucked, army-knife style, into the handle. The screwdriver can stand straight or bend at 90 degrees for extra torque in hard-to-reach spaces. The shaft is also magnetic, so you can keep loose screws at hand while working. Add a built-in tape measure, liquid level, carbon steel hammer, and an LED flashlight, and you’ve got a multi-function tool that blows competitors out of the water. This ingenious little device really is a toolbox in the palm of your hand. And it’s much better than using a butter knife as a screwdriver or trying to hammer a nail with your stilettos!